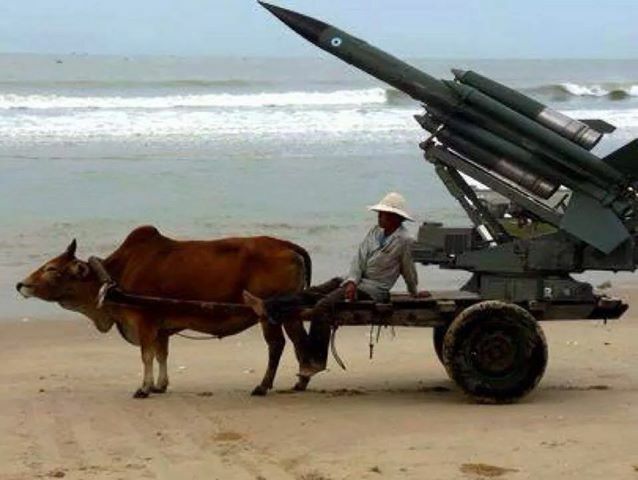 The present tension does provoke Vietnamese humor as well. This pix went viral among Vietnamese facebookers last week. Tension and outright fear is once again spreading in Asia. While most of the world is watching Russia, worrying about Putin’s designs on Ukraine, China is making the most of the opportunity – in what Beijing calls the South China Sea. In the past week, China put a gigantic oil rig deep into Vietnamese territory along with some 80 vessels, including war ships. A Chinese oil rig on the prowl in Vietnamese territory. As in previous incidents, the Vietnamese navy responded with moderate attempts of intervention, leading to confrontation – so far limited to material damage and a dozen wounded sailors. The Vietnamese have in their legendary sarcasm labelled China’s claim “The Ugly Buffalo Tongue”, and looking at this map, it certainly seems that China is about to lick up the entire ocean along with the contested Spratley Islands. In recent years China has also shown its ambitions in other ways. Two years ago, China issued a new passport design with a map, which shows a China, slightly enlarged with a pieces of present Vietnam as well as India. Next followed a territorial dispute with Japan, which included ‘spontaneous mob attacks’ against Japanese companies in China due to ‘public anger’. 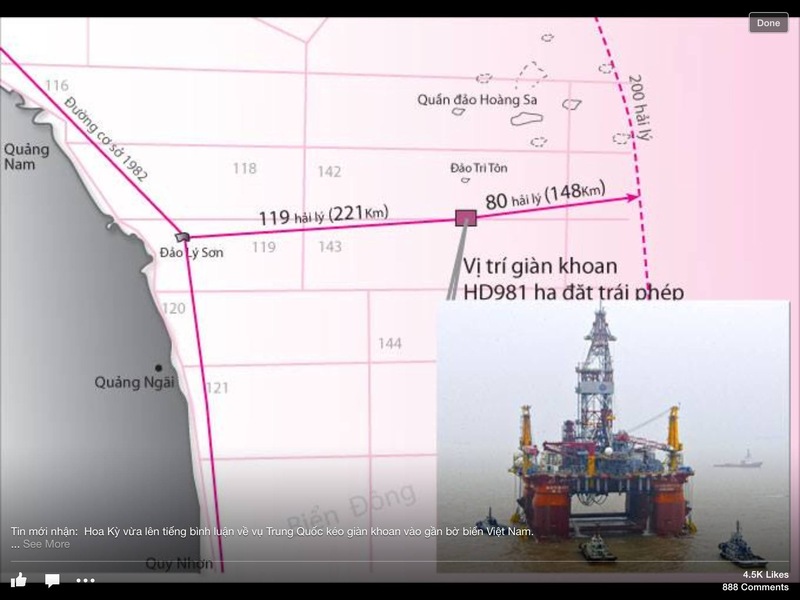 According to Vietnamese media, the Chinese oil rig is drilling 148 km inside Vietnamese territorial waters. A new China Syndrome is certainly spreading in the region, while Putin’s Russia enjoys the undivided attention of the entire Western hemisphere. 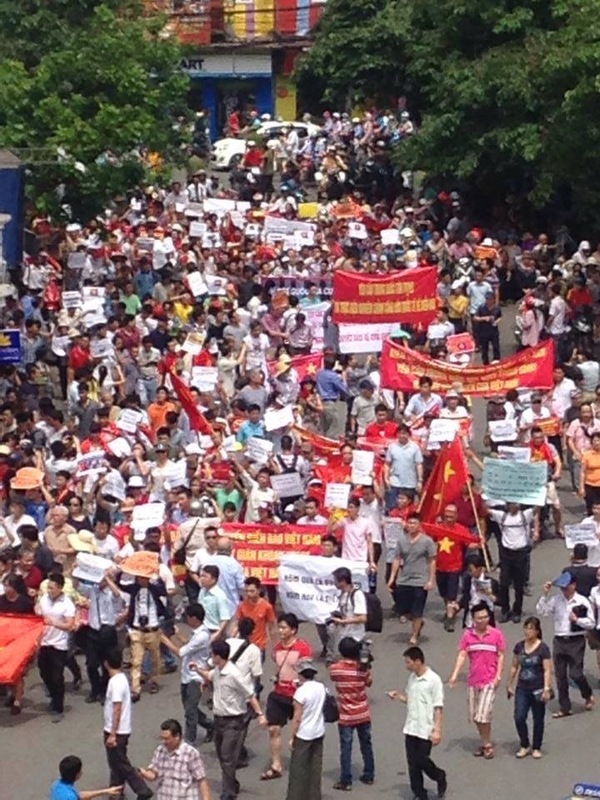 Vietnamese authorities allow a rare demonstration on its way to the Chinese Embassy in Hanoi. THE 2 KOREA’S – WHERE THE COLD WAR IS STILL HOT! Our “Dora” takes the stage. Today, I tried something as odd as a sight-seeing tour to the Cold War, where it is still alive and kicking, the ‘DMZ’ – a No Mans land between the two Korea’s. We were were guided by a charming drama princess “Dora”, a 21-year old tourist-pro, who has nicknamed herself after the Dora mountain on the border between North and South Korea. Dora knew her history well and a few jokes lightened her four hour speech, as we toured the DMZ, including the observation post on top of “my mountain” and the locked down “Dora railway station” with intact departure signs for Pyongyang. Dora also took us down one of the famous communist-secret tunnels “The Third Tunnel”, which allegedly were designed to bring 30.000 soldiers an hour from the North along with artillery pieces. “The communists put in a lot of hard work to build this tunnel. Now, we are making a lot of money from showing it to the tourists,” Dora said with a mischievous grin. The tunnel is blocked with no less than three armored steel doors, so its not likely that the North will come this way unnoticed anytime soon. The heavy military presence everywhere on the Southern side of the DMZ provided the perfect stage for Dora and her guests. “Are you scared?” she asked us time and again with a flirtatious grin. I, for one was worried – that is, if I was going to make it back from the visit to the tunnel 73 meters below the ground – a 350 meter ascending slope, equivalent of walking up a 20-floor highrise, is the only way of getting down there and back again. My girlfriend dared me – so there was no way escaping the ordeal. Luckily, I did resist the temptations of the souvenir shop, which offered DMZ-rice in 10k and 20k bags and ‘genuine DMZ barbed wire’ on a commemoration plate. Though it is somewhat weird to see a very serious, prolonged conflict turned into a sight-seeing cash-cow, I do salute “Dora” for today’s update on the eternal South Korean collective paranoia – and honest to God, you cannot blame the millions, living in Seoul an hours drive from the border, that they exercise extreme caution vis-a-vis the mad-men regime looming on the other side of the DMZ.